I can’t tell you the number of people who, when I tell them I lived in Thailand, respond with, “ooh, I’ve heard Phuket is nice!” It’s pretty typical for people to think about Phuket, Krabi, “that awesome beach where the movie The Beach was filmed” when they think about visiting Thailand. And why not? It’s the most tropical part of Thailand with the sandy beaches, clear blue water, and endless sun. For me though, what’s even more wonderful about these places and the surrounding region is that it brings a great deal of variety and deliciousness to Thai cuisine. Extremely different from the northern region of my last post the southern region brings new flavors, ingredients, and even different brighter colors! Located closest to the equator, the southern part of Thailand receives a steady amount of sun throughout the year along with eight rainy months which allows for very fertile growing conditions. (Check out the pictures; it’s a lush jungle over there!) This fertility means that crops such as coconut and rubber can grow more abundantly and thus become some of the key outputs from this region. Thais use this abundance of coconut to their advantage when cooking by using the milk to thicken soups and curries, the oils for frying meats and fish, and the meat as a grated accompaniment. As a coconut fiend I kind of love the food of the south for this very reason. Unfortunately, southern Thais also like their food incredibly spicy. I mean really spicy. Their use of chilies is far beyond my tolerance so when traveling in the south I have to act a bit more like a farang (foreigner) and ask for things mai pet (without spice). It’s okay though, the rest of the amazing flavors make up for it! Additionally, the climate also allows for a wealth of fruits and nuts to grow, most commonly pineapple and cashews. These crops can be found in a number of different delicious dishes including gaeng massaman and gaeng saparot. If you haven’t checked out my Gaeng Saparot Gai recipe you definitely should. It’s aroi mak! 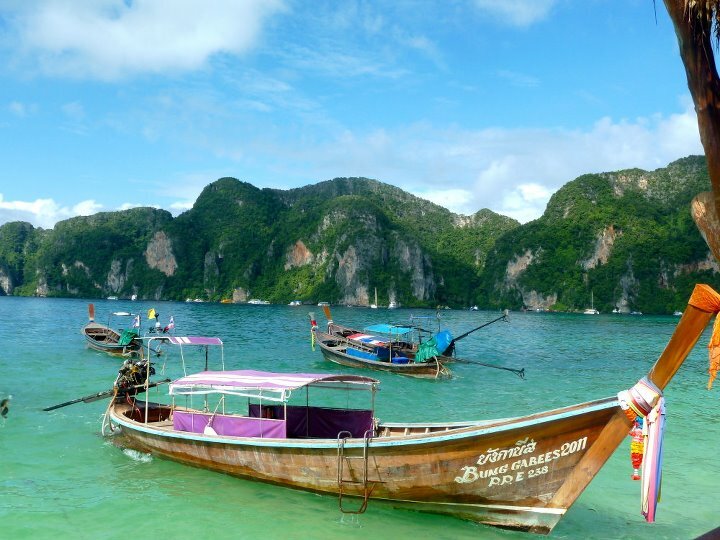 Another important geographical feature is the bodies of water that surround southern Thailand. Thais use what is available to them thus making seafood a popular protein of the region. Whether it is fish, lobster, crab, mussels, squid, prawns, or scallops, Thais consume far more seafood in the south than they do chicken, pork, or beef – the popular proteins of the more northern regions. They also use a variety of cooking methods from steaming and frying to one of my favorites – baking in a clay pot (often accompanied by noodles) … yum! So far I’ve only discussed how the geography and climate of the region define Thai cuisine of the south, but this area is also very heavily influenced by its neighboring country Malaysia. Islam is the largest practiced religion in Malaysia, and consequently, southern Thailand is heavily populated with Muslim Thais. The cuisine of this area is much more similar to Malaysian and Indian cuisine than other areas of Thailand. Specifically, food in this region relies heavily on turmeric, a brightly colored root that is found often in Indian cuisine. The color of this root is what makes some curries of Thailand a brighter yellow color (including the recipe below). Muslim influence also makes roti – a round flat wheat bread – a very popular accompaniment in place of rice. Rice is grown far less copiously in this region so this delicious bread product is used at both normal meals and as a dessert. Okay, a little tangent here. I am absolutely obsessed with Thai roti! Roti as a dessert is delicious. I mean absolutely, insanely, mind-blowingly, “I would fly back to Thailand just to have a serving of roti” delicious. Think sweet crepe but more fried and crispy lathered in butter and most commonly (at least where I was living) served with bananas, cinnamon and condensed milk. I guess you could say it has some similar features to an elephant ear but 150 times more delectable. Alright, that’s it; I need to post a recipe for that ASAP. Be on the lookout. Okay, back to business. There also happens to be a large Chinese population in southern Thailand which brings regional specialties like khanom jin (or chin or jeen or however else you want to spell it). This is a dish of rice noodles cooked in one of a number of different curry soups and often served with fish. This isn’t one of my favorite dishes, but maybe I just haven’t had the right stuff yet. I know of quite of few people who love it and I’m open to keep trying until I find one that suits me! So there you go … southern Thai cuisine. 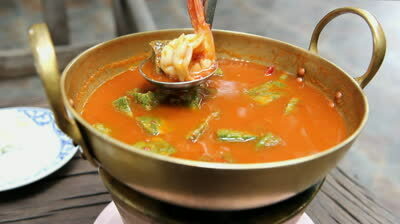 In the spirit of adventure and trying new things here is a southern Thai recipe for you to try! This is another yummy curry but very different from other curries you’ve probably had. However, give it a shot. It’s tasty and you just might find your new favorite recipe! 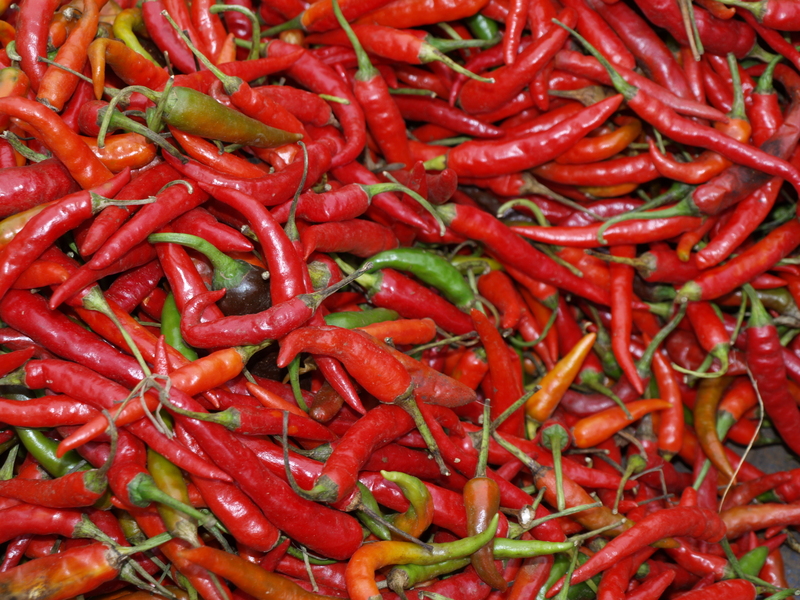 To make the paste, soak dried chilies in warm water for 20 minutes. Remove and set aside. Roast shrimp paste in a foil packet (wrap paste in foil) on element for 2-3 minutes on each side. Place all ingredients into a food processor with a small amount of the chili soaking water and puree. Add more liquid if it seems too dry. To make the curry, put the water in the pot with the curry paste and set over high heat. When boiling, lower heat to medium and let simmer for 5 minutes. Do not shorten this time as cooking the paste is required for a yummy taste! Add all the seasonings to taste. Add more or less depending on your preference. Add the vegetables and let the soup boil again. If the vegetables cook quickly, add them after the shrimp. Add the shrimp and cook until they are done and the water is back to boiling again. Serve with rice and other accompaniments like a fried omelette or fried vegetables.